My grandfather raised horses in Montana and my dad had a cattle ranch and used good horses all the time. 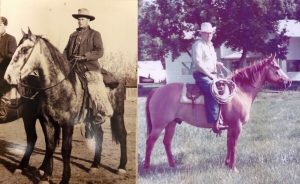 Growing up, I wanted to be just like dad, so starting at six years old, he gave me a series of horses that fit my maturity: first a pony, then an older, gentle horse, then his own favorite horse, then horse of my own, then he raised two colts for me to train myself and let me pick the one I wanted. After that he bought a registered quarter horse that I trained and rode for years. All through the series he gave me suggestions on riding and training horses … always in the context of working with cattle and getting a job done on the ranch. When I was 12 the colt was old enough to start riding and he still gave me guidance, but he never rode the colt. She was a beautiful filly and a great horse that saw lots of use on the ranch and she was a grand champion at the fair. The quarter horse turned out just as good, also a grand champion at the fair. My dad got on him once for the picture above. Because I was interested in something that was close to my dad’s heart, he went out of his way to help me and he was proud of his son. My dad did love me, but that wasn’t the whole story. I loved him, wanted to be just like him and went with him all the time. We worked together! Our heavenly father is the same, when we seek what’s in His heart and put the Kingdom first and work together, He goes way out of His way to show us how and open doors of favor, and give us that which is own. Like my natural father, as our stature grows, and our hearts are aligned with His to co-labor, He keeps giving us bigger and better “horses.” Fathers aren’t afraid to be extravagant with their sons. It feels good! I hadn’t noticed the parallels in “growth.” There is a pattern we can apply in our lives. Wisdom is knowing why. Wisdom takes initiative based on knowing what’s in my Father’s heart and what’s in my book. The beginning of wisdom is the fear of God. That means I’m cooperating and co-laboring with my Father, yet, as a king and friend, I am free to innovate out of my own heart. Stature is my standing before God in heaven (righteous). God’s eye, His favor and His grace flow through those “work” with him … not as obedient servants or slaves, but from the heart because we know His heart. “Stature” is the status I have with God that allows me to ask for the desires of my heart. Our stature grows with our appearances in the courts of heaven and the progress we make on earth. Favor (charis, grace) is not on me, it’s in me. It’s His power working in me to reign with Him. Grace and power are synonyms. Notice Paul refers to it as “my power” and “then I am strong” … it’s in us. It’s Jesus’ power, but it’s working in our hearts through our initiative. 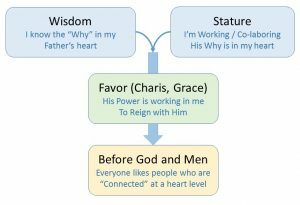 Favor with God and men – Everyone (including God) likes to work with people who are connected and powerful at a heart level. We are fervent, inspiring, motivated, enthusiastic, excited, purposeful and practical. God and men both love to empower those who walk out wisdom and stature to get results. Works – Go with your Dad! We don’t get words from God just to share them with others. The primary application is always in our own lives. Faith does come by hearing from God, but if it doesn’t translate to action that produces fruit, the revelation dies (dead). Books – We all have a practical, kingdom assignment in a mountain. We need to our why and we need to take the initiative to express that why in what we do vocationally. Each of us have some “entrepreneur” in our calling… creative, industrious, innovative, initiatives. Wisdom – Did you notice Samuel and John grew in stature or in spirit, but Jesus was the only one who grew in wisdom? Wisdom addresses the practical application of revelation … the wealth multiplication, cash flow, the relationships, the organization, the team. Wisdom is what gets results and brings and Kingdom to earth. Weaknesses, insults, hardships, persecutions, difficulties – Things don’t always go right. God isn’t micromanaging our lives, so nothing goes wrong. Part of wisdom is managing risk and standing through setbacks. You’re not the only one; it’s all of us. All by itself – The good soil of a right heart grows without any effort … all by itself. 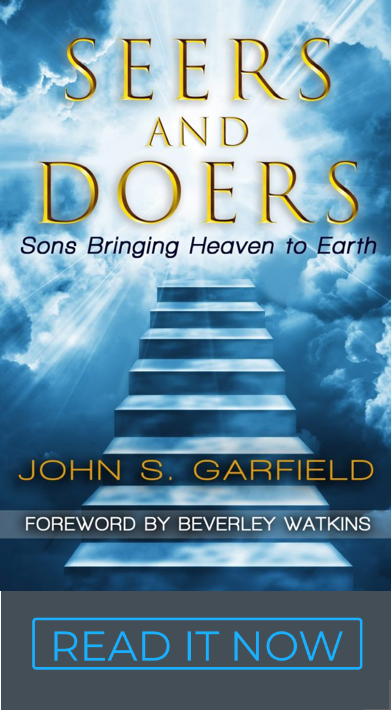 We naturally want to co-labor with our Father because His desires are deeply in our own heart. We have fruit in our lives because we want to.